IFC Midnight’s WOULD YOU RATHER is now available on SundanceNow, Cable VOD, and other digital outlets (iTunes, Amazon Streaming, PS3 Playstation Unlimited, XBOX Zune, Google PLAY and YouTube). Ever wonder what was going on in the filmmaker’s heads when they created the heart-stopping horror thriller WOULD YOU RATHER? Now you can find out! Director David Guy Levy and Writer Steffen Schlachtenhaufen sit down and watch their film, out loud. Check out and download the audio commentary on Soundcloud and get some insider insight as you watch the film starring Brittany Snow, Jeffrey Combs and Sasha Grey… for a second time. The film is currently available on iTunes and other digital outlets. What would you do if a millionaire offered you a chance to solve all your life’s problems? After the tragic death of her parents, Iris (Brittany Snow) is desperate to make ends meet while caring for her terminally ill younger brother. Shepard Lambrick (Jeffrey Combs), a seemingly philanthropic aristocrat, expresses an interest in helping them. He invites her to an exclusive dinner party that offers the chance at untold riches. When she arrives she finds herself in a group of similarly desperate individuals from the gruff middle aged Conway (John Heard) to the dark loner Amy (Sasha Grey). They soon find themselves trapped in Lambrick’s mansion and forced to play a sadistic game of Would You Rather, where only the winner will get out alive. As the game progress Iris must decide how far she will go to save her brother… and herself. 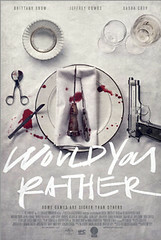 WOULD YOU RATHER is an edge of your seat horror thriller with an ensemble cast that also features Lawrence Gilliard Jr., Eddie Steeples and Charlie Hofheimer.